83.5% dependent. It is high. 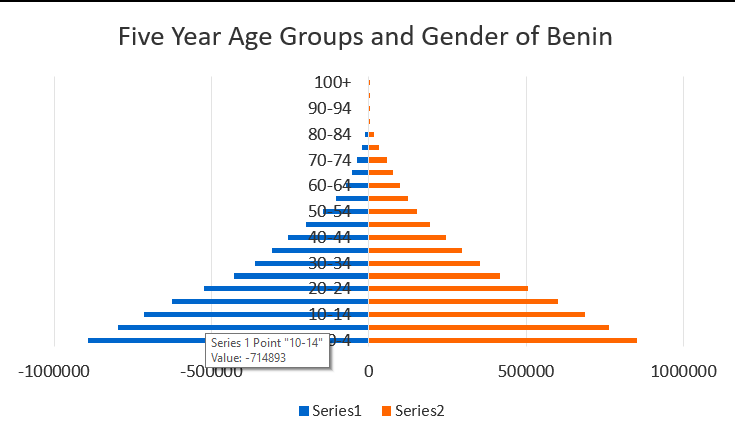 High births, which are going to be dependent on the working age cohort, we have more kids than adults. We have less deaths than births; meaning they are getting an enhanced health care system/ everything is evolving. There are slightly more women than men in this country. This is an expanding pyramid. This is around stage 2. This country needs to keep making medicine, needs to increase food production, needs to make more schools and hospitals. They might need to make a policy of how many kids you are allowed to have if the population continues to increase at the rate its going. The health of these people are generally good but they die off around 80, but since there are high birth rates the death rate will increase later on so the country might want to make room for cemeteries and they might want to start businesses that help elderly people, like transportation or have more senior homes. using this formula can tell us a lot of things that will help us graph the equation. In fact it will tell us 8 helpful clues. Vertex: the vertex will be p and q … (-2,-1) * p is always backwards from the formula because in the original equation it is (x – p) therefore it has to be a negative number for it to become positive in the new equation. Domain. We know the XER because the parabola never ends. The horizontal translation will be 3 units to the right even though it says -3. I also learned that general form can be turned into the analyzing equation of by completing the square.